What’s your view about digital marketing? Do you see it as a strategic business function for the survival and growth of your business or otherwise? These days, everyone is talking about digital marketing. And I’m sure you’ve noticed the different kinds of digital marketing strategies being used by the businesses that see it as a strategic function. 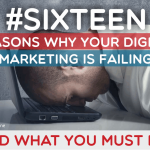 Like it or not, digital marketing has come to stay. And if you’ve not created a digital marketing strategy yet for your business, now is the time to begin. Everything from researching to buying from a trusted brand by customers, is taking place online. And due to the rate of change occurring in the business world, “digital” seems to be what most companies are creating in their businesses right now. And those who are implementing it effectively in their business are reaping its benefits—visibility and profitability. So, in this post, we will be looking at what digital marketing is from a thought leader’s point of view, our own definition and the essence of a 360° digital marketing strategy. There are lots of digital marketing definitions out there. And I’m going to open this section with a definition from no other person than Lee Odden, CEO of TopRank Marketing. According to him, he defined digital marketing as a term used to describe the integrated marketing services used to attract, engage and convert customers online. That is, to him, digital marketing is utilizing multiple channels such as content marketing, influencer marketing, SEO, social media and online advertising to help brands connect with customers and uncover performance of marketing programs in real-time. In my opinion, his definition is solid, but could use some clarity. And the next definition (from us) will provide more clarity. 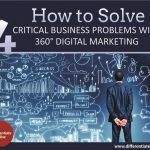 So, what is 360° digital marketing? At Differentiate Online, we define 360° digital marketing as an integrated and holistic online marketing strategy that helps smart businesses create a 360° online presence for their company, products and services (brand) so that their target customers can know, like and trust them enough to buy. A website is the starting point of any successful digital marketing strategy. Why? Because your website is your office online and the primary destination of all your digital marketing campaigns. In essence, your website is your company’s digital marketing platform. 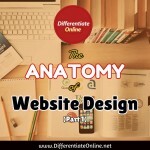 Design strategy is how we creatively craft an unusual website that reflects your unique brand, set you apart from the competition and create a lasting first time impression on your target customers. 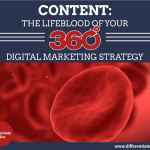 For a 360° digital marketing strategy, content strategy refers to your overall story telling strategy – your message. It involves the use of texts, images, audio and video to conceptualize and articulate compelling stories about your brand. Without a content strategy, your brand wouldn’t be able to attract the attention of your target customers online. Content strategy is how to tell a compelling story (about your brand/business) that captures the interest and attention of your target audience, and engaging them as they travel through the entire buying process – from target market to prospects and from prospects to sales. Like all forms of marketing, people are the target. So for a 360° digital marketing strategy, traffic strategy refers to how we get people (your target customers) to your office online (website). It’s how to create online visibility for your brand by enabling your office online (website) to be searchable on search engines like Google and visible on social networks like Facebook to attract visitors (prospective customers) to your website on a daily basis. 1). What happens when people get to your office online (website)? 2). What happens after people leave your office online (website)? To help our clients answer these 2 critical questions, we integrate persuasive sales funnel into every website we create that will strategically turn visitors (traffic) into leads (prospects) and leads into sales (profitable customers) with a long term win-win relationship. 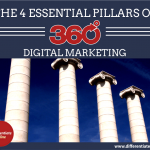 As defined above, these 4 critical elements of design, content, traffic, and conversion make up our Complete 360° Digital Marketing Framework for Smart Business. If you would like to create a 360° digital marketing strategy for your business, click here to get started now! Or would like to learn more, read on! 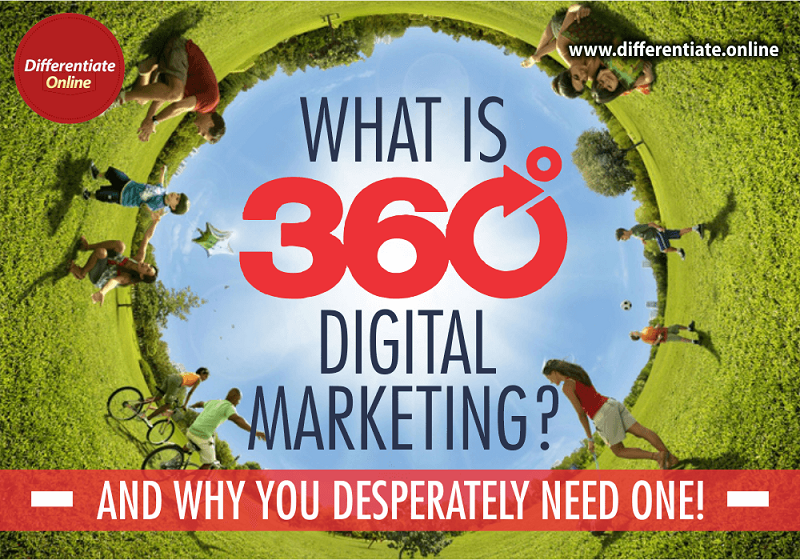 Why is 360° digital marketing VERY important? There are lots of reasons why we created Differentiate Online as a 360° digital marketing solution for smart business. And we’ve published two articles (which you will find at the end of this section) on this issue. We’re also working on a third one. And it’s going to come out with a longer list than the other two posts. But before you rush to read the recommended posts, let’s start with the most obvious reason – your target customers are online! According to Internet World Stats, Nigeria internet users ranks 8th in the world and 1st in Africa with an increase from 9,962,224 (6.8%) in 2007 to 75,746,751 (42.7%) in 2014. And from 2014 – 2016, Nigeria internet users also increased from 75,746,751 (42.7%) to 86,219,965 (46.1%) respectively. This means that, the number of Nigerians that make use of the internet on a daily basis is on the increase. And businesses who sees this as an opportunity are getting online (or they’re already online) to grab the attentions of these Nigerian internet users. And if your business is not online, your guess is good as mine, you will be missing out in the prospective/profitable customers that you can target in the pool of over 80 million internet users in Nigeria! Find Prospective Customers: By using design strategy to craft an unusual website (your online office) to target prospective customers i.e. finding your target market online to enable them know more about your brand/business. Attract Prospective Customers as Visitors: By using design, content and traffic strategies to engage them to checkout your products/services i.e. attracting them to visit your website (24/7) to know, like and trust your brand/business. Convert Prospective Customers (Visitors) into Profitable Customers: By using content, traffic and conversion strategies to turn them from prospect into profitable customers i.e. influencing them to buy from your brand/business. Retain Profitable Customers: By using design, content, traffic and conversion strategies to keep them coming back and to ensure a long term win-win relationship i.e. retaining them as repeat customers who know, like, trust and buy from your business consistently. And solving these four critical business problems: finding, attracting, converting and retaining profitable customers are essential to the survival and growth of every business. Once again, would you like to create a 360° digital marketing strategy for your business, click here to get started now! 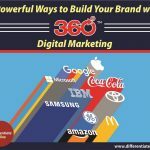 At this point, you’ve understood what a 360° digital marketing strategy is and why it is VERY important. So, how do you make your brand/business visible and profitable online? By clicking here to get started on how we can create a 360° Online Presence for your company and make your brand/business visible and profitable online.